The year 2019 kick-started on a determined note with the exhibitors and integrators having joined hands to invigorate many other innovations for the days to come ahead. Advances in cinema display technology are providing moviegoers with sharper images and a greater dynamic range. The market has embraced Laser and LED-powered projection as the new norm. Huayi Brothers Cinemas has deployed Christie’s next generation RealLaser cinema projectors at its flagship multiplex in Shanghai and is to be powered by Christie’s state-of-the-art, direct-coupled RGB pure laser projection systems. To state alongside, Vettri Theatres in Tamil Nadu has become the first cinema in India to be equipped with Christie’s next generation CP4325-RGB RealLaser cinema projector. Wanda Cinemas in Beijing is here with the world’s first ‘All-LED Multiplex’ (6 Screens). With its unparalleled brightness and High-Dynamic-Range picture quality to present movies with a clearer image and a greater detail than traditional movie screens and home theatre systems, it has already raised the bar for premium multi-functional movie theatres to a much greater height. In addition to the concept, consumer electronics major Samsung is planning to install around 20 LED cinema screens ‘Onyx’ in India by the year end. Samsung had unveiled the new technology recently, which marked a renowned shift from theatre projection systems to LED screens in the country. A premium large-format cinema screen (PLF) is a clearly defined, technologically superior product, which can be marketed at a premium and cinema exhibitors believe they have found a new revenue driver in PLF. Sony Electronics Inc. is introducing Sony Digital Cinema, the company’s experiential premium large-format (PLF) movie theatre auditorium. Working in conjunction with state-of-the-art movie theatre company, Galaxy Theatres, the world’s first location will debut at their Las Vegas Boulevard Mall venue and is planned to open shortly. Post all the mind-crushing reshoots, edits, finishing touches and everyone involved in breathing life into Avengers: Endgame, the movie is finally up to hit the screens this 26th April. Marvel’s marketing machinery kicks into overdrive to try and make this upcoming movie as one of the biggest blockbusters in history. With Captain Marvel tracking higher ahead of its opening weekend than the original projections had indicated it’ll be interesting to see how Endgame’s opening box office shapes up this spring. 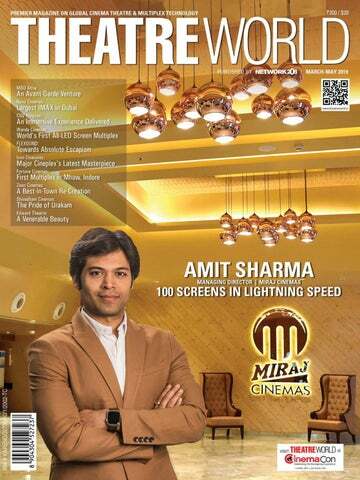 Recently, when Miraj had completed 58 screens, I had made a promise to Amit Sharma to have him on the cover page of TheatreWorld magazine on the completion of 100 screens and hereby have kept my word. TheatreWorld congratulates Amit Sharma and his team for having reached this success point at an unbelievable speed. As cinemas are gradually increasing in India with the exhibitors gearing up with new ideologies to bring the audience back into cinemas and measures to provide them with the right content, indeed this is a great moment for not just the brand but the cinema exhibition industry on the whole. The year 2019 will witness massive product launches and CinemaCon is sure to emerge as one of the most happening platforms for the next-generation technology. This year, CinemaCon, at Caesars Palace, Las Vegas, USA held from 1 – 4 April, is poised to get bigger and better than ever before. See you all soon! Do not forget to pick the magazine copy at CinemaCon!!! Raghavendra T Editor-Publisher DISCLAIMER - TheatreWorld Magazine does not warrant or assume any legal liability or responsibility for the quality, accuracy, completeness, legality, reliability or usefulness of any information, product or service represented within our magazine or web site. The information provided is for knowledge or entertainment purposes only. TheatreWorld Magazine does not endorse or recommend any article, product, service or information found within said articles or advertisements. The views and opinions of the authors who have submitted articles to TheatreWorld Magazine belong to them alone and do not necessarily reflect the views of TheatreWorld Magazine or its staff. Sandeep Mittal Founder Editor-Publisher RNI # KARENG02795/10/1/2002-TC TheatreWorld is a quarterly publication, on the motion picture exhibition industry, for private circulation. It reaches out to subscribers, mainly theatre owners and trade professionals around the world. Additional copies are being promoted at major international industry tradeshows. TheatreWorld seeks the healthy promotion of the theatre industry through dissemination of useful information. Some of the information is compiled from industry sources, trade journals, company brochures for the benefit of readers, especially, theatre owners. 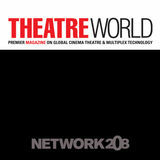 TheatreWorld acknowledges with thanks the authors and publishers of these printed materials. Views expressed in the articles are those of the authors and not necessarily of TheatreWorld. TheatreWorld is a trademark under registration. The contents of TheatreWorld are under copyright registration. All rights reserved. Reproduction by any means in whole or part without written permission is prohibited. Unsolicited printed material is welcome but no responsibility is undertaken for the same and will not be returned. TheatreWorld does not take responsibility for the absolute accuracy of information published. This issue of TW has two sets of page numbers - International pages TW-1 to TW-52 for TW, and India pages TM-1 to TM-54 for TM. TM is inserted between pages TW-47 and TW-48 of TW. The Theatre is Certainly Now on Demand!!! the UK. ODEON launched its first ODEON Luxe cinema in October 2017 with recliner seats in every screen, full luxury refurbishment to the whole cinema, plus a new food and drink retail offer including an Oscar's Bar, and signature guest service. Eleven ODEON Luxe cinemas are now open across the UK, with more to come this year. In addition to the new Cinemark theatre, Cottonwood Creek Market will offer an impressive line-up of trendy restaurants, entertainment and a variety of retail shops in its 285,000 square feet of space covering 63 acres. The centre will also include multifamily homes and office space. "We are pleased to welcome Cinemark to Cottonwood Creek Market," said Steve Alvis, the cofounder and managing partner of NewQuest Properties. "The Cinemark theatre will anchor our entertainment wing, which will have an exciting collection of restaurants and retail in a beautifully landscaped environment." Cinemark & Spaces Embrace the Future with VR in San Jose Cinemark Holdings, a leader in the motion picture exhibition industry, announced plans to build an amenity-packed, 14-screen theatre in the new Cottonwood Creek Market development in Waco, Texas. Located at the intersection of I-35 and Loop 340/Hwy 6, the theatre is part of a 143-acre, master planned, mixed-use centre developed by NewQuest Properties and is scheduled to open in the spring of 2020. All 14 auditoriums at the Cinemark Waco and XD theatre will boast advanced technology and customerpreferred amenities including Cinemark Luxury Lounger electric recliners, an XD auditorium and more. "We are proud to work with our long-time partner, NewQuest, to bring the Waco community the ultimate moviegoing experience with our new Cinemark location coming soon to Central Texas," said Mark Zoradi, Cinemark's CEO. "With our Luxury Lounger recliners, XD auditorium and more, Cinemark will give guests the opportunity to enjoy the newest films in one of the most innovative viewing environments." the resistance in the fight against Skynet in a heart-pounding, untethered, adventure that takes place in the Terminator universe. The first Cinemark SPACES experience will be "Fight for the Future" based on "Terminator Salvation." Upon entering Cinemark SPACES, guests will register and scan their faces using SPACES' unique, proprietary face scanning technology. Fans will then be immersed in a free-roam, virtual reality battle with up to four people in a group. Transforming locations into digital playgrounds, SPACES invites guests to engage their senses through virtual reality, haptic feedback and environmental effects that guests can reach out and touch. The moment they take off their headsets, guests will immediately receive a cinematic video of their experience that they can take home and share on social media. "At SPACES, we say 'Go Anywhere, Do Anything' where guests are the stars of the experiences," said Shiraz Akmal, SPACES CEO. "We provide consumers an incredible, virtual reality adventure where they can suit up and escape with their friends. Guests depart from SPACES and are transported into the action. We especially love that our experiences are meant to be shared; people repeat the experiences with friends and family again and again." with the opening of our new Century Southland theatre in Hayward," stated Mark Zoradi, Cinemark CEO. "Moviegoers are sure to enjoy the comfortable Luxury Lounger reclining seats and beer and wine options as they make our 33rd Bay area Cinemark location their entertainment destination for years to come. "In the upcoming weeks at the Century Southland Mall theatre, guests can enjoy a variety of Hollywood's holiday blockbusters including Mary Poppins Returns, Bumblebee, Aquaman, Spider-Man: Into the Spider-Verse and more. promise to provide an enriching cinema experience, as it reinvents the way our customers experience the magic of the movies with engaging and immersive effects such as snow, rain, motion, and more." "4DX provides an opportunity for directors to showcase movies the way they are meant to be felt. There are some experiences in 4DX so distinct that it cannot be replicated by a traditional cinema. It changes the movie paradigm for audiences from being a spectator to being the participant with a role in the heart of all the action," she added. GSC is targeting to open another two 4DX locations in 2019, which will be located in GSC IOI City Mall, Putrajaya as well as at GSC Southkey, Johor Bahru. Apart from 4DX, GSC is also poised to open its first ScreenX cinema in 2019- a multi-projection theatre that allows a 270-degree panoramic movie experience. By utilising a proprietary system to expand the screen to the side walls, audiences can go beyond the traditional frame with surrounding imagery that gives a sense of being inside the movie. Al Futtaim's AED 300 million community mall at Masdar City, which is set to lead the way in sustainable retail and leisure operations in the capital when it opens in the first half of this year. My City Centre Masdar's construction has created 1,500 new employment opportunities in its build-out phase and over 2,000 new jobs after opening. "As we progress on developing our first mall in Abu Dhabi, My City Centre Masdar underscores Majid Al Futtaim's commitment to the capital's retail sector in line with Masdar City and the UAE's long-term sustainability goals," said Ghaith Shocair, Chief Executive Officer of Shopping Malls at Majid Al Futtaim - Properties. "My City Centre Masdar demonstrates the delivery of our strategy to create retail destinations that address the specific needs of the communities we serve, while underscoring Majid Al Futtaim's sustainability focus by engaging with them to promote an eco-friendlier lifestyle." My City Centre Masdar aims to achieve Abu Dhabi's Estidama Three Pearl rating, making it one of the UAE's most sustainable malls. The capital's rating system is equivalent to the LEED Gold rating for exceptional performance in energy and water conservation. options from cafes to family restaurants. City Centre Suhar will service a population of 570,370 residents in the burgeoning port city and industrial hub, Suhar, and surrounding districts, Liwa and Shinas. "We are pleased to introduce our renowned City Centre brand to Suhar, providing a single contemporary destination for residents and tourists to enjoy a curated mix of international and regional retail outlets, outstanding leisure activities, and unique dining experiences. Majid Al Futtaim is committed to delivering an unrivalled retail and lifestyle experience to growing cities in Oman, and the opening of City Centre Suhar achieves a major milestone in our investment strategy for the Sultanate," said Husam Al Mandhari, Senior Mall Manager Oman - Shopping Malls at Majid Al Futtaim - Properties. Conveniently located on Batinah Highway, City Centre Suhar has added 35,301 sqm of gross leasable area to the Sultanate's booming retail sector. opening which is the minimum requirement to collate operational data. This includes implementing sustainable building best practice with enhanced insulation, irrigation by condensation, LED lighting and solar panels that will contribute to the centre's energy requirements. City Centre Suhar is part of Majid Al Futtaim's strategy to increase its total investment in Oman to OMR 705 million (USD 1.8 billion) by 2020, which includes Mall of Oman. Majid Al Futtaim's investment in Oman's retail, leisure and entertainment infrastructure supports the country's National Strategy for Tourism 2040, which targets a 6 per cent rise in the contribution of the tourism sector to GDP, and a near doubling of visitor numbers to 5 million annually. the two Academy Awards for Technical Achievement that the company won in 1988 and 1993, and an enlightening live projection showcase featuring Christie's history, various achievements in cinema, and the ground-breaking RealLaser technology. The cinema complex features a circular-shaped lobby resembling a travelling pathway that leads visitors to every auditorium. The pathway connects the ticketing booth and candy bar with the cinema halls, serving as a conduct that invites audiences to embark an exciting journey of movie exploration. The design concept is focused on the comfort of the movie-goers - the overall lighting is set up in such a way that they can easily adapt from brightly-lit pathway to the darkened cinema halls.Christie's RealLaser family of projectors offers all the advantages of RGB pure laser in a compact "all-in-one" form. This eliminates the need for sub-ambient external cooling, which further reduces operational cost. Christie RealLaser consistently delivers excellent image quality and brightness above DCI standards throughout the projector's natural life. enormous. They are entitled to something special," says Emi Lin, General Manager of Kbro Cinemas. For Lin, the goal was to turn the movie show into a very rich experience. "Barco's High Contrast Flagship Laser projector offers images that are brighter, sharper, and richer in terms of contrast. This gives the audience a more immersive movie sensation." What does it mean for the operational side? "From the standpoint of a cinema operator, the stability and consistency of images at every screening really helps us to streamline our operations," explains Lin. and engage fans with big screen stories. The first location, at Galaxy Theatre's deluxe Boulevard Mall site, will be the largest auditorium in the Las Vegas market, further enhancing Galaxy's distinction as the Best Movie Theatre in Las Vegas, according to Las Vegas Weekly and Las Vegas Review-Journal. "This location in Las Vegas is the first in what will be a nationwide rollout of Sony Digital Cinema experiences, which will drive audiences to the movies," said Bob Raposo, head of cinema at Sony Electronics. "Sony has the capability and tools to be involved in every aspect of a film, from capture, workflow and post-production, to film production and distribution, and experiential theatre solutions. We are uniquely positioned to understand and develop products that directly impact and elevate cinemas and their audiences." "We strategically chose Las Vegas, a city synonymous with world-class entertainment, for the launch of our new Sony Digital Cinema auditorium at Galaxy Theatres," explained Rafe Cohen, president of Galaxy Theatres. "We strive to exceed customers' expectations of a best-inclass theatrical destination, from the concessions and the seating to the technology. We turned to Sony, a company known for quality and excellence, to create a first of its kind Sony Digital Cinema auditorium that is sure to make our Boulevard Mall location a destination for those seeking the best cinematic experience on every level. "For more than a decade, Sony has been working with many of the world's biggest and most prestigious theatre chains, as well as small independent circuits and art house cinemas to provide exceptional products, service and support that re-invent the movie-going experience and robust offerings include 4K, laser, lamp, HDR, 2D and 3D projection technology options. Sony solutions provide the flexibility requested by theatres, and the superb image quality and natural colour reproduction that enhances audience engagement. Dolby and Tahoe Partner to Expand Dolby Cinema Footprint in China Dolby Laboratories and Beijing Tahoe Film and Culture Development Co., Ltd. (Tahoe Cinemas) recently announced an agreement to expand the Dolby Cinema footprint in China. Tahoe Cinemas is a subsidiary of Tahoe Group and its professional investment platform in film industry. Tahoe Group is a major enterprise in China with businesses extended to real estate, healthcare, education, film, finance and other fields. different viewing experience that presents strikingly vivid and realistic images. Tahoe Cinemas plans to open 10 Dolby Cinema locations in China, extending the premium cinema experience to more moviegoers across the country. "Our presence in China continues to grow and we are excited to partner with Tahoe Cinemas to bring the Dolby Cinema experience to more people," said Doug Darrow, Senior Vice President, Cinema Business Group, Dolby Laboratories. "More and more moviegoers in China can be fully immersed in spectacular experiences at these new Dolby Cinema locations." This summer, the Kuwait National Cinema Company (KNCC) opened an all-laser movie theatre in the premier Al-Kout Mall, the country's largest waterfront shopping and entertainment centre. "Our new multiplex Cinescape theatre in Al-Kout sets the bar high with cutting-edge technology that leaves moviegoers speechless," says Khaled Al-Marzooq, business development manager at KNCC. "And we have Cinionic to thank for that." Cinionic provided laser projectors for all nine state-of-the-art theatres at Al-Kout Mall, all featuring advanced cinema technologies. The cinema is the first in the region to operate a high-contrast laser projector, one of Barco's Flagship range. Khaled Al-Marzooq: "Kuwaiti moviegoers have always been a very demanding audience, but with these next-generation cinema experiences, even they are left speechless." Dolby Atmos sound technology moves audio around the theatre, even overhead, with amazing richness and depth. The combination of Dolby technologies with the design and comfort of the Dolby Cinema makes audiences feel closer to the onscreen action than ever before. territories where Qube Wire content delivery services are now available includes major regions of the world and both developing and mature markets, from Australia to Southeast Asia to Africa to Europe and the Americas. Professional Solutions China of Sony (China) Ltd. ("Sony") and GDC Technology Limited ("GDC") today announced Sony's SRX-R608-DS dual 4K laser projection system integrated with GDC's next-generation SR-1100 integrated media block (IMB) completed the full range of tests necessary to receive compliance from Digital Cinema Initiative (DCI). As a result of receiving DCI compliance for this latest projection system, exhibitors are positioned to capitalize on the continuing advancement in laser and high dynamic range (HDR) technologies with a high-end, reliable product designed for small theatres. The test was completed by the Research Institute for Digital Media and Content (DMC) at Keio University in Japan, one of three entities licensed by Digital Cinema Initiatives, LLC to perform the Compliance Test Plan (CTP) tests. The SRX-R608-DS with SR-1100 IMB was approved by DCI after successfully passing the DCI Compliance Test Plan Version 1.2.
content, KDM, and connectivity issues are highlighted so they can be resolved ahead of time and keep screenings on schedule. As well as automating hardware commands and common theatre operations, such as playlist and schedule building, it ensures that the correct KDMs (Key Delivery Messages) are available and ready ahead of playback. Screenwriter customers also have access to AAM's free ScreenConnect add-on, which facilitates fully automated KDM delivery through AAM's pioneering collaboration with Deluxe Technicolor Digital Cinema (DTDC). It allows any KDMs generated by DTDC to be delivered directly from DTDC's systems to the exhibitor's screen servers, and provides DTDC with delivery confirmation so that they can proactively resend any KDM that didn't reach its destination. "We're very proud to bring the best solutions in the world to cinemas in our region," noted Emily Hong, President at Dacoms Technology. "Partnering with Arts Alliance Media means we can offer Showtime Cinemas, and exhibitors like them, a fully-featured, world-class TMS. "Patrick Foley, CEO of Arts Alliance Media, added, "We're delighted to have, once again, been selected as a trusted software partner by one of the top exhibitors in the region. It is always inspiring to see how our software solutions continue to fuel successes worldwide." Trésor Films and Chi-Fou-Mi Productions). Distributed in France by Pathé, Antonin Baudry's "Le Chant du Loup" ("The Wolf's Call") is the first release mastered for Samsung's new emissive technology to be shown at the Pathé Beaugrenelle in Paris. "We are proud to be the first lab in Europe to offer this type of 4K HDR remastering, which combines unprecedented technical performance and visual quality with optimal brightness and vivid, refined colours, from immaculate whites to the deepest blacks," says Pascal Mogavero, Senior Vice President of Eclair. "The Onyx solution is also Eclair Color-certified through our global partnership with Samsung, and we anticipate growing demand from both producers and distributors." Eclair is the only company in the EMEA to provide professional services specifically tailored for the Onyx Cinema LED - contrast ratio of 1000000:1, HDR grading at 300 nits, and DCP mastering - for filmmakers, producers and distributors. To this end, Eclair installed an Onyx Cinema LED grading room & auditorium at its Paris-Vanves facility last November featuring a 3D-capable 5.2-meter screen, 18 seats, 7.1 audio technology from Harman's JBL, and a full colourgrading suite. sized 5.1/7.1 cinemas. The SR-800 and SR-1000 surround loudspeakers deliver high-quality sound performance and product features at a new, economical price point. The SR-800 Cinema Surround Loudspeaker is a two-way design that features an 8" low-frequency transducer with a 1" dome tweeter. The 125-watt continuous power rating and sophisticated crossover circuitry provide absolute reliability. The SR-1000 model is also a two-way design, featuring a 10" low-frequency transducer, a 1" compression driver, and 150-watt continuous power rating. Both units are designed for safe and secure mounting and feature a compact black enclosure with a black grille that blends into any theatre decor. The cabinet is constructed of 12mm MDF with internal bracing for superior structural integrity. Rear panel cabinets are fitted with four threaded insert mounting points that accommodate the standard bolt pattern for most third-party bracket manufacturers. Included pre-installed speaker side hardware allows fast single-installer wall mounting, and brackets support down angles of either 15 degrees or 23 degrees. A traditional U-bracket "yoke" style bracket is also available. In addition, advanced DSP presets for QSC's DPM cinema processors are available for both loudspeakers to simplify set-up, ensure high quality performance, and minimize total system cost. "QSC is proud to offer a high-performance option for the budget-minded theatre operator," states Barry Ferrell, Senior Vice President, Cinema. "The SR-800 and SR-1000 models enable QSC to deliver high-quality sound to a much broader range of customers." equipped with complete sound systems from QSC, the leader in cinema sound, and meet strict technical specifications. In addition to properly equipping the room with the optimal sound system, the CTP also evaluates acoustics, sightlines, and image quality. "Providing the best possible movie experience requires paying attention to many details, beyond just installing the right sound and projection equipment," says Mark Mayfield, Director of Global Marketing for QSC Cinema. "In fact, that's usually the final consideration. It really begins with a properly designed room, with interior finishes and furnishings that don't negatively impact the visual and aural experience. The QSC Certified Theatre Program requires that all of these factors are considered in evaluating the total experience. If all the specifications are met, then we'll certify the room and provide a complete marketing program to help the theatre operator communicate the fact that their theatre is the best place to experience a movie." ScreenX and exhibitors to implement DTS:X technology into ScreenX locations. DTS and ScreenX have collaborated to optimize the flexible and scalable DTS:X technology for ScreenX auditoriums while ensuring that the filmmakers' creative intent is delivered to audiences for a captivating moviegoing experience. "DTS:X immersive audio technology complements CJ 4DPLEX's ScreenX immersive visual presentation, offering an amazing end-to-end product for exhibitors," said Bill Neighbors, SVP and general manager, Cinema, Home, Digital Media and Streaming Solutions, at Xperi. Colosseum," explains Richard Mitchell, VP Global Marketing & Commercial Development at Harkness Screens. Each year the Colosseum transforms into one of the best cinema auditoriums in the world and we're extremely honoured that our premium 3D/2D screen technology continues to be recognised as the best in the industry for creating superior movie-going experiences." At its core, Clarus XC technology features 4th generation d-smooth coating technology which has specific properties more commonly seen in white screens. This technology enables Clarus XC screens to benefit from significantly wide viewing angles, improved colour and contrast and better light distribution compared to traditional 3D silver screens. The screen also features Harkness' Nanolast coating technology which provides additional improvements in visual performance as well as added durability and Harkness' proprietary 4K Digital Perforation Pattern designed to improve sound transmission in the spoken range, reduce moirĂŠ effect often seen in 4K projection and increase light reflectivity. In addition to the showcase Clarus XC screen, Harkness will also provide a number of Perlux HiWhite screens which will be on display in the Octavius ballroom. Perlux HiWhite screens are regarded as the whitest gain screens available with ultra-wide viewing angles, superior uniformity, colour and contrast and all Perlux HiWhite screens are natively laser-ready. has gone from 0.8mm to 0.55mm. Smaller openings are less visible up close; viewers can be seated near the screen without seeing the openings. The new pattern alignment prevents holes from interfering during the welding process; this eliminates the possibility of small imperfections appearing in the union. Volfoni's TripleBeam Patent Granted in Russia Volfoni is pleased to announce the recent granting of its Russian patent number RU2669544C2. This patent protects the triple-beam technology underlying Volfoni's award winning SmartCrystal Diamond passive three dimensional cinema product. This patent had already previously been granted in both the USA with reference number 9,740,017 as well as in China with reference number ZL201320848220.0 and the extension of this patent also in Russia now ensures Volfoni's innovative technologies are fully protected around the world. "The recent granting of this patent in Russia is further confirmation of Volfoni's continued innovation and ensures the technology behind Volfoni's flagship product, the SmartCrystal Diamond, is protected throughout the world. Volfoni will not hesitate to use its extensive patent portfolio in order to protect its products and technologies to the full extent of the law", says Dr. Bertrand Caillaud, COO of Volfoni. "This patent confirms Volfoni's commitment to serve all its customers around the world and is further confirmation of the quality of innovation being carried out by our team", added Araceli Vaello, CSO of Volfoni. Volfoni's3D Elliptical Polarization Patent Approved in the USA Volfoni is pleased to announce the recent granting of its three dimensional (3D) elliptical polarization patent no. US 10,151,932 in the US territory. Previous third-party cinema systems for 3D have required the use of passive 3D glasses based on either circular or linear polarization. However, Volfoni's new innovation instead uses passive 3D glasses based on elliptical polarization. This not only improves the overall light efficiency and performance, but also avoids a host of other third-party IP which specifically mandate the use of circular polarization. This adds to Volfoni's extensive patent portfolio comprising fifteen granted and pending patent families around the world, including five US granted patents 10,151,932, 8,648,899, 9,740,017, 9,395,549 and 9,594,255, three US pending patents 16/137,891, 16/150,594 and 62/ 733,216, two European granted patents WO2011104316A1 and WO2014080018A1, two Chinese pending patents 201810347582.9 and 201820551483.8, as well as three French granted patents 2,973,523, 2,978,564 and 2,987,211. "Volfoni's extensive patent portfolio comprising of fifteen granted and pending patent families around the world is testament to Volfoni's extensive investment into research and its commitment to bringing cutting-edge innovation to the 3D cinema industry", said Dr. Bertrand Caillaud, COO of Volfoni. "Volfoni's continued development of new products and technologies brings great benefit to our customers around the world and sets new standards in the 3d cinema business", Araceli Vaello Garcia, CEO of sales, added. Returns, Paramount's Bumblebee, and Warner Brothers' Aquaman. In addition to these Hollywood blockbusters, MX4D programs select regional and national releases in native languages. MPAA Welcomes Netflix as New Member The Motion Picture Association of America (MPAA) has added Netflix as a new member of the global trade association that advocates on behalf of the film and television industry. "On behalf of the MPAA and its member companies, I am delighted to welcome Netflix as a partner," said MPAA Chairman and CEO Charles Rivkin. "All of our members are committed to pushing the film and television industry forward, in both how we tell stories and how we reach audiences. Adding Netflix will allow us to even more effectively advocate for the global community of creative storytellers, and I look forward to seeing what we can all achieve together." Netflix joins other leading producers of film and television content that make up the MPAA, including Disney, Paramount, Sony, Fox, Universal, and Warner Bros. The MPAA advances the business and art of storytelling, protects our members' content across all screens, defends the creative and artistic freedoms of storytellers, and supports innovative distribution models that bring an ever expanding array of viewing choices to audiences worldwide. "Joining the Motion Picture Association further exemplifies our commitment to ensuring the vibrancy of these creative industries and the many talented people who work in them all over the world," said Ted Sarandos, Netflix Chief Content Officer. "We look forward to supporting the association team and their important efforts." introduced for the first time in the city. â&#x20AC;˘ INSTALLS â&#x20AC;˘ experience of high-end technology, they may even forget they are sitting in a theatre," said Chun Wai. MBO's Innovative Offerings for in Atria Mall MBO Kecil: The new line-up at MBO Atria Shopping Gallery will include two MBO Kecil halls, a concept hall that serves as a dedicated space catering to parents and their children from all ages and sizes. With elements like Kecil Family-Bed, Bean bags, a playground inside the cinema as well as the regular seats for adults, MBO is pioneering the effort to change the way that families interact at the movies. Unlike traditional cinemas, MBO Kecil will allow kids to run free and play to their heart's content while enjoying their best-loved films. On top of this, the KECIL hall will also provide parents an opportunity to organise birthday parties for their children, making it an unforgettable experience with their loved ones at MBO Cinemas. entertainment. Dolby Atmos has become the preferred choice for next generation sound in the cinema and has been embraced by major studios, directors, and exhibitors around the world. Currently over 1,000 movie features are released or announced in Dolby Atmos. Coca Cola Freestyle: On top of the customary popcorn and soda that completes the movie experience, MBO Cinemas is also introducing Coca Cola's new revolutionary drink concept with over 46,000 outlets worldwide. Moviegoers can choose a variety of flavours with over 50 drink combination choices via an interactive touchscreen dispenser. This unique service will also be customised to provide flavours accustomed to Malaysian's local taste bud, namely Lychee, Mango and some from the A&W variants. we have taken extra attention to equip our cinema halls with only the best of what sound and projection has to offer for maximum viewing pleasure. We have also introduced new offerings outside the hall to make our customers cinematic journey at MBO Atria a pleasant one," added Chun Wai. MBO Cinemas in Atria Shopping Gallery offers 4 standard screens on top of the 4 special screens, bringing the total to 8 screens and seats a combined total of 1229 movie goers comfortably as well as Cafecito a unique coffee house themed concession stand serving fancy beverages and light snacks. Towards Absolute Escapism The first commercial movie theatre boosted by FLEXOUND Augmented Audio will immerse moviegoers with the feel of sound being launched recently. The world pioneer cinema is located in the Nordic frost of Mäntyharju, Finland. FLEXOUND Augmented Audio for the cinema market complements current sound systems. It combines high-quality surround sound with physical vibration, creating a unique, immersive cinema experience. The technology offers equal sound quality in every seat independent of the seat location. It improves the clarity of dialogue and enables lower sound volumes in the theatre. Augmented audio requires no wearable accessories. audio range and the vibration with only one Flexound module per seat", says Flexound's Chief of Cinema Mika Oesch. Experience FLEXOUND Augmented Audio at CinemaCon 2019, Las Vegas and secure the next big thing of cinema to your theaters. "Our technology is universal and can be used for a wide range of seats. Largest IMAX in Dubai Ever heard of a 'Cosmic' themed cinema? The 12-screen multiplex; designed to immerse customers into an otherworldly reality, stands for a futuristic design using more than 5,000 meters of LED strip lighting in customized colours and mirror lighting from floor to ceiling is a sight to behold and will take any film screening to new heights. The location offers multi-purpose cinema screens available with presentation stage, making it the perfect space to hold corporate events and meetings. With this the flagship location at IMG Worlds of Adventure in Dubai has got a lot to offer in store. with presentation stage, making it the perfect space to hold corporate events and meetings. â&#x20AC;˘ INSTALLS â&#x20AC;˘ colours ever available on-screen. The new experience also features IMAX with Laser's 12-channel sound technology with new side and overhead channels that deliver a greater dynamic range and precision for the ultimate in audio immersion. Debbie Stanford-Kristiansen, CEO of Novo Cinemas said of the opening: "Our inspiration for this unique new location was to transport our guests to a new reality or another world, while delivering that 'WOW factor'. We truly believe that this amazing cinema will do just that - with the biggest IMAX with Laser screen in Dubai, we are confident of delivering a jaw-dropping cinema experience like never before. We are also very grateful for the support of our partner IMG Worlds of Adventure, who have allowed us the freedom to continue pushing the boundaries of design and experience. No two Novo Cinemas are the same as we focus on innovation and creativity in all our venues". access the park and meet their silverscreen heroes in real life, including famous Marvel characters. including the introduction of exciting new F&B offerings, this new theatre will be top of the choice list for any movie-goer. Paragon Cineplex, Quartier Cineplex, and MEGA Cineplex where mentioned locations has given the luxury taste to the customers, hence Major Cineplex Group can ensure that ICON CINECONIC is going to be the next designed masterpiece on the list. Smart Ticket Scan and Go: where customers can just bring the QR Code from Major Application or E-Ticket and scan through Smart Ticket at the front door. IMAX Projection: CINECONIC installed the new IMAX projector that supports High Frame Rate (HFR) screening that will benefit the picture screening to be smoother that will enhance the movie experience; decreasing blurry visuals. 4DX: Brand new 4DX at ICON CINECONIC with the newest effect fog storm and for the first time that 4DX comes with Laser projector that can allow the movie to be brighter, sharper. It is also equipped with the latest JBL to give the sharpest sounds in theatre wherever you may sit. ICONIC Dine-in Cinema: To unlock the new experience where you not only enjoy the movie on the VIP Opera Chair but to also serve you with special food and beverages from famous restaurants which would be served by your own personal butler. Living Room Theatre: To give the living room atmosphere just like watching the movie at your own living room. Also facilitates the option of a private party that allows you to pick and choose your movie. It comes along with premium services right from exclusive lounge that will serve your favourite food and drink. special price at THB120 (normal seat) for every movie and every showtime. By the end of 2018, Major Cineplex has operated in three countries; Thailand, Laos and Cambodia, with the possession of 160 branches in total; 143 branches located in Thailand, 3 branches in Laos and 4 in Cambodia. Having 771 screens with more than 170,000 seats, it continues to expand across Southeast Asian Region. Thai special Popcorn Bar: The space that lets you enjoy the variety of toppings. In addition, the bar also serves Thai style popcorn such as Satay Popcorn, Crab Curry Sauce Popcorn, which is served only at ICON CINECONIC. In short, all these features make the cinema standout in the market with its excellent amenities only to bring out the best for the moviegoers. This cineplex has been sponsored by 3 companies which are Chaopraya Mahanakorn as naming sponsored for 4DX under the name CMC 4DX, Government Saving Bank as naming sponsored for IMAX under the name GSB presents IMAX, and Thai Airways as naming sponsored for VIP Lounge under the name Thai Smooth as Silk Premier Cinema. As of ICON CINECONIC's grand opening, the new icon of world Cineplex, Major Cineplex Group gives back to the customers to enjoy cinema experiences for 2019.
and 22.4 metres high. CGV Yongsan also houses the world's first 4DXScreen X combination theatre. As part of recent renovations to keep the multiplex on the cutting edge, CGV Yongsan hired Kinoton Korea to replace the theatre's aging sound systems with state-of-the-art JBL Professional speakers and Crown amplifiers. â&#x20AC;˘ INSTALLS â&#x20AC;˘ deliver a truly immersive moviewatching experience. The HARMAN systems really bring the film soundtracks to life, and set a new benchmark in terms of performance and sound quality. We look forward to implementing similar solutions in future installations." In order to ensure enhanced soundtrack reproduction with unmatched accuracy, Kinoton Korea outfitted 18 of CGV Yongsan's theaters with an array of JBL Professional cinema loudspeakers, subwoofers and surrounds. The wide range of JBL speakers enabled Kinoton to tailor the system response to each theater's unique dimensions and deliver perfect coverage at every seat. For the main front channels, Kinoton installed six JBL 5742 four-way ScreenArray cinema loudspeakers, 30 JBL 4732 three-way ScreenArray cinema loudspeakers and 34 JBL 3731 two-way ScreenArray cinema loudspeaker systems. Kinoton also installed 68 JBL 4642A subwoofers to ensure extended low frequency support. Additionally, Kinoton provided 14 JBL 8320 Compact Cinema Surround speakers, 12 JBL 9300 Cinema Surround speakers and 60 JBL 9310 Cinema Surround speakers to ensure deliver realistic three-dimensional audio. Kinoton powered the speaker systems with Crown DSi Series amplifiers. The reliable performance and onboard digital signal processing of the DSi Series amplifiers match perfectly with the JBL ScreenArray systems. "We are thrilled to see our solutions being used by a global cinema giant like CJ CGV," said Ramesh Jayaraman, VP & GM, HARMAN Professional Solutions, APAC. "HARMAN brands like JBL and Crown are known in the cinema world for their superior audio quality, performance and longevity. We thank CJ CGV for placing their faith in HARMAN solutions to achieve their goals. We also thank Kinoton Korea for their technical expertise and customer-focused service during the installation." World's First All-LED Screen Multiplex Wanda Cinemas delivers the ultimate immersive audiovisual experiences as the world's first all-LED multiplex. With its unparalleled brightness and High-Dynamic-Range picture quality to present movies with a clearer image and a greater detail than traditional movie screens and home theatre systems, Wanda Cinemas has already raised the bar for premium multi-function movie theatres to much greater heights. Wanda Cinemas, China's largest film distributor and cinema operator, recently partnered with Samsung and HARMAN Professional Solutions to create the world's first all-LED cinema multiplex. HARMAN Onyx Cinema Solution frees up space that would typically be used by traditional projection methods and enables the theatre operators to experiment with different types of ambient lighting and room geometry. The versatility of the Onyx Cinema Solution also offers Wanda Cinemas the flexibility to generate revenue with new kinds of events, such as corporate presentations, concerts, games and more. massive and the future of the growth of film exhibition will widely be driven in this direction. Innovative smart marketing tactics could also result in increasing footfalls across theatres by introducing special schemes and promotions. one can bring on the table to convert them into a 2 screen or a 3 screen. "At times you're lucky to even have space for retail down and much other activities around with it as well." he says. Needless to say, that all these locations in the tier 2 and tier 3 has disposable income when looked at the centres. People do not have many opportunities to go out and spend time with their families, entertainment. There are not many places that they can have a good seating in a secured safe manner. because the bigger players right now are not interested in looking into the same. So this could be an opportunity for the local players, entrepreneurs and existing cinema owners who are looking forward to refurbish the theatres and fill the gap up, but to always remember that gap is huge and it needs to fill swiftly. He comes across lot of interesting facts is that a lot of tier 2 or 3 or 4 cities which would have a population of over 2-2.5 lakhs today have atleast about 80-90 kind of centres. Amit talks about the challenges faced on keeping the screens running. One needs to understand firstly from an exhibition perspective; population is not the criteria to actually categorise into tier 3, 4 or even smaller towns butis the movie consumption behaviour. So in the country, it differs from north to east; south to west and so do the movieconsumption patterns. Therefore, movie consumption behaviour must be generated in tier 3 tier 4 rather than actually just counting on the population number. That's the first point to clarify when generally talked about smaller towns. The movie consumption is something that is to be taken care off. Therefore, it is very important to look at the market to understand. For instance maybe a Chinwada and Reva Hindi belt does not give you an option of regional films and also because of the option of the movie consumption being very low; but when you go down south in places like Rajamundry and Kakinada or maybe Tiruvanamalai, the movie consumption is considerably very high. The biggest problem is that the exhibitors and owners lack the much needed government support in expanding this industry. All remain at a kind of an announcement level; couple of news items in the papers and then nothing gets done. Also, there are entrepreneurs who have the land and the right amount of capital but would never think of coming into cinema business as they majorly lack knowledge. Talking of tax anywhere in the world, the maximum margin that can be taxable is 10% on a cinema business. Some of the countries have 5% and most of the countries don't even have it. So the industry as a whole needs to take a look at this process. It is not going to work if the exhibitors or the service providers only work in it. The support of the producers and distributors also are much needed. Dina further adds a presentational discussion on the new concept of MoviEcard. "Basically, the major fact about India is that we have the highest number of movies released and the highest number of tickets sold. If you were to look at the number of movies released in the US versus the number of movies released in China versus the number of movies released in India, we obviously have got the content bucket right. We have way more creative people and way more opportunities in terms of the number of movies that we release and the number of tickets that we sell. Therefore, the highest number of tickets; the highest number of movies." she says. Significantly, the number of screens which we have in this particular area and in cinemas is much lesser than what we have across the world. Our screen density is the lowest. Interms of screen density per million, India is just seven. Moving to the number of accessibility, the whole idea is being the number of screen count which the exhibitors are aiming for. Currently, a different kind of rise is being looked at. Rise is not in terms of number of people going to cinemas growing organically but it's the ticket price which is steadily growing. So the organic occupancy inside cinemas may not have been able to increase, but cinemas are still growing and they are not dying because the growth of the ticket prices is controlled considerably.The idea is that cinemas or exhibitors and distributors; the fraternity sitting today, basically needs a solution; And the solution cannot be that the number of screens versus the number of movies released versus the number tickets and then nothing works out She further elaborates the concept of MoviEcard that was basically launched last year; it's a simple cost of one ticket. At the cost of oneticket, the member watches movies for 30 days but would be valid from Monday to Thursday. Thus, effectively identifying the space that the cinemas are not able to fill. Weekdays are what we suffer most. "We may have occupancy between 10-25%. But 75% of the year, if you 25% % occupancy, I don't think we'll be able to bank only on weekends. This is a weekday programme; at the cost of one ticket, the customer watches 30 days of movies, effectively 16 movies. There are certain riders, its one movie 1 day, one title a time. Currently, if you see the kind of price points, MoviEcard has been able to actually compete in that category." Dina said. "The concept is to give them the habit of coming back to the cinemas. The stickiness of coming back to cinemas is most important. We have stopped going to cinemas because we can't afford more than once in three months. We wait for a 'Bahubali', 'Dangal'. A family spends almost a INR 1200 on an average for a hit movie. Its INR 300 ahead. This is for them to come back to cinemas, watch it as frequently as you've been watching it when you're parents were kids which was every matinee show, every Friday show." Akshaye talks about cultivating the habit of going to the movies at cinemas. And besides what's done at the exhibition level and loyalty programmes such as these, the need to drive the footfalls through the right kind of content is critical. "Whether you buy a Maruthi or a Mercedes, you need fuel to run it and I think it needs to be a more consolidated, synchronized effort between the producers, distributors and exhibitors to help the value chain sustain and do well robustly." He comments. On the other hand, Arjit looks towards 'Trying to increase business in tier BCD stations'. The capex is and the ATP level is such where the recovery is questioned. It started over a period of years that we are not even being able to cover the electric cost. And unfortunately, with cinemas, exhibitors have nowhere to go. So where the government is concerned, they are speechless and their budgets have no space for us. So that's one of the problems where the cinema owners are concerned. We as well as the film industry is totally neglected from the centre and including at the state level. The cinemas, I have not seen anything being given to cinemas over the years. It's a well-known fact that the tier BCD centres are actually 70% more or less dependent on regional content and that's something that needs to be subsidized. And that's why there are different tax slots for the national language film and for the regional language film. Moving into the subject, he talks about how to get the business to work. Fortunately or unfortunately for our industry, 'Content is King'. But from our point of view, we have lots to do. It's not just about setting up a five-star lobby or an auditorium alone. He also talks on positioning the theatre which is extremely important in today's market point of view. "Movie-going is a matter of habit that has to be grown. There are a lot of centres. For instance, say Tripura. The people there had just lost the habit of watching films because over 15-20 years or more, there were no theatres in the state. Now getting that audience back into the auditorium, making them pay for the ticket instead of seeing it on television, it's a herculean task." He adds. TAKEAWAY A good movie going experience solves these problems when you give multiple opportunities for the audience to explore your space. These locations mostly are centrally located rather when you look at tier 2, tier 3 cities. The cinemas that were made those days have very good positioning. Unfortunately, today in the centre, when looked at a green field project, lots of compromises to make because most of the centres are either built outside the city or in extensions and not many options come into the city. But when you look at tier 2 and tier 3, these opportunities are lucrative to look at; when seen located at a very densely populated place and the kind of footfalls that you expect definitely meets your requirement. Overview: The organic growth in the cinema business is hampered by multiple factors. Woefully the government policies, piracy, DTH, online rights and the recently introduced GST are hindering the organic growth of cinema business by achieving low number of cinema screens in the country. Screen density in India is the lowest in the world. India has 10 screens per million people as against 124 in the US and 90 in China. State governments should formulate specific policies and provide tax benefits so that more and more businesses come forward to open cinema screens in semi-rural and rural areas. Apart from this set-up, antipiracy efforts must ensure that cinema business can grow further. required too as the single screen owners are not capable to invest that much money because those screens are almost 3-4 decades old. Regardless of a conversion or up-gradation of the cinema of the single screens, the right support from the government concerning the finance and tax exemption is a must. As GST has come up, the existing tax exemption policies have all been abolished currently. With mutual take in the same, the exhibitors feel that these policies must be revived again. The benefits too should be made available for the long-term process to get some type of attraction to the investors or the developers so as to come forth and invest in these single screens. Otherwise, it is very difficult to revive all the single screens back into play. have been taken to set up the central box-office measurement system in India for the last four years, though we have succeded to some extent, we still see that the benefits of having such a system is still lost on a lot of single-screen owners. It would put the whole problem in perspective and will considerably solve a whole lot of problems that we are facing today." TAKEAWAY There is a huge opportunity in the market but then nothing is being done due to the government policies which is largely stops the operators from expanding. While one cannot contain the quality of the content, the mass and the appeal and the audience's consumption behaviour, what we can ceratinly works towards is the ancillory revenues from those structures that could possibly favour. Now, single-screens, to be converted into malls and retail spaces is not possible while retaining the same structure. For the ones, who find it hard to generate the capex to do it, ancillory revenues to come into play from the same structure is much needed for. And for that again we come back to the question of licensing. Its extremely important that single-screens come into play. Possibilities though being many to sort hindrances out, it still must be debated about, thought over, get the feasibility figured and have it assured that there are viable options to keep these properties in the existant civil set up. Ofcourse there is a cost effectivness portion to it. Hence, eventually there is a need to adopt this technology to bring about the information on the way the entire business is being run. That is the whole point for getting into technology that sloves these problems that can stregthen our capabality to reach out to the government or to an investor to bring in the funds. The quality aspect which is another gradiant factor is not in the hands of the exhibitor but yet the quality plays the huge role in the expansion of cinemas business. major Asian and Hollywood films and curated programmes, specifically geared towards the needs of the Asian cinema exhibition community. It brought together the key decision makers from every major, regional and independent theatre circuit with the major International Film Distributors, as well as the manufacturers of products, services and technologies for the movie theatre industry. CineAsia included screenings of upcoming films, product reel presentations, educational seminars, special events and award galas. An overview of how Indonesia is changing fast along with it consumer behaviour; is shifting gears with an expected uplift by 50 million people over the next five years. • Sustainable Technology to WOW Audiences: A presentation that discussed a few key technologies to Wow audiences; these are HDR, laser projection and Netflix-like technologies for movie theatres to offer a wide variety and a deep assortment of movies without adding operational cost. • Regional Presentations: Presenting local content from throughout the APAC region. Distributor of the Year: Fu Ruoqing, Huaxia Film Distribution Co. Ltd.
• Laser Illuminated Display Technologies: Science Becomes Art: A Christie content demonstration on how laser & the cinema experience may evolve. Poised to be one of the biggest conventions till date, CinemaCon 2019 is here! Since taking its first step in 2011, CinemaCon has evolved and grown to become the largest and most important gathering for the worldwide motion picture theatre industry. CinemaCon is a global event attracting attendees from more than 80 countries. 2019 beautiful conference centre, the finest hotel accommodations, world-class restaurants, and the magnificent Colosseum, the stateof-the-art venue that proudly allows CinemaCon to showcase all studio screenings and presentations in the ultimate theatre setting. film, that same moviegoer would rather drive the extra distance to ensure they are getting the ultimate, state-ofthe-art presentation and theatrical experience possible. Today's demanding moviegoer is looking for optimum picture and sound quality, theatre seats that provide great comfort, a ticketing system that is quick and efficient, a concession stand that offers a diverse array of food and beverage items and a theatre setting that provides the best amenities imaginable- all of which makes that movie going experience worth driving the extra distance. Today's cinema owner is just as demanding and discriminating when it comes to the building of new theatres or the remodelling and maintenance of existing theatres. The theatre market is competitive and the stakes are high. CinemaCon serves those competitive, high-stakes market, giving cinema owners from all over the world the opportunity to experience the latest and most important advances in the world of theatre equipment and concession products, CinemaCon offers the world's largest platform geared specifically for the motion picture theatre owner. It is here that decision-making cinema owners and executives walk the aisles, keeping an eye out for new equipment, products and services that will help make theirs the "go-to" theatres. F U T U R E Shazam! The Curse of La Llorona Production Summit Entertain. Jabariya Jodi Production Dharma Prod.